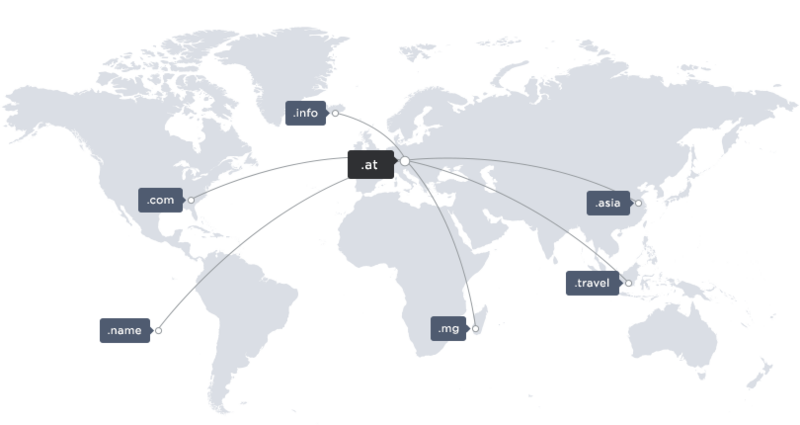 A whole world of domains is waiting for you. Choose from 400+ domain extensions – find the perfect domain for you. .at domains for only EUR 14,90 a year. The same is true for all other domains: less is more. Let our low domain prices convince you. Spare yourself multiple logins and manage your domains and hosting from one location. We would be happy to carry out website migration for you with our Move service. 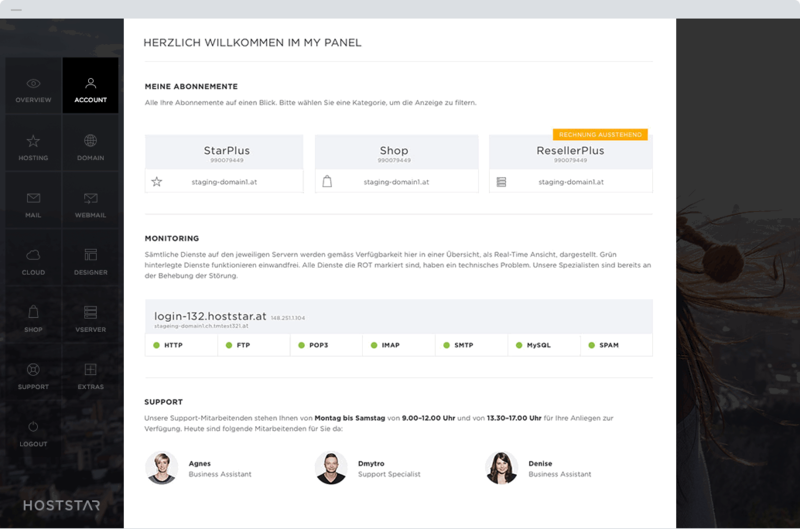 In My Panel you have a central and intuitive tool with which to manage all your domains. Whether you have one, 10 or even 100 registered domains; My Panel makes it all easy. The right domain is critical to the success of your website. In addition to the traditional .com domain extension, there are countless other extensions -the possibilities for creative expression are almost endless. Choose from over 400 domain extensions. Whether you’re looking for international extensions like .net or .org, local ones like .at or .li, or one of the many others – register your dream domain today before it is gone! Please enter a valid domain ending or select your new domain from the list below. 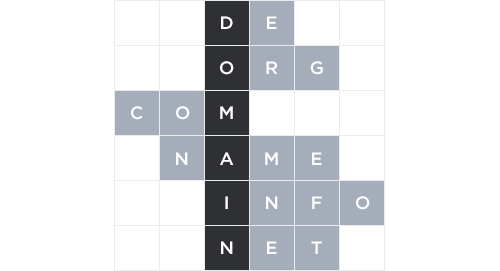 Expand additional categories to check even more domain endings. The entered domain ending is not in our offer or is invalid. In the domain list below you can find your new domain with other extensions suggested. Expand additional categories to check even more domain endings. Please enter your new domain without "www." in the format "hoststar.com", or select your new domain from the domain list below. Expand additional categories to check even more domain endings. The domain «@domainName» is already registered. Transfer your domain name to Hoststar now! If you are not the Domain owner of «@domainName», please enter a new domain or choose another domain ending from the list below. Expand additional categories to check even more domain endings. An error has occurred. Please get in touch with us. You can reach us at order@hoststar.com or +41 (0)84 800 80 80. Enter your desired domain (without extension) into the input field. Looking for ideas for a domain name? You can use our Domain Wizard to generate domain names that suit your website in just a few steps. You can transfer your registered domains to us at any time. The transfer is free of charge and the existing term will be taken over. Your website will remain online continuously during the transfer. Benefit from our low domain prices and the simple administration of all your domains in My Panel. A long list of domains can quickly become unmanageable. The modern user interface of the Domain Manager helps organise even the biggest list. Listed clearly and sortable by various attributes, active domains and how long they have been registered are visible at a glance. If you don't yet have a domain name of your choice or if someone else has already registered it, it's best to start with a brainstorming session. Make a note of the terms that match the content or style of your future website, including any synonyms. You can also add adjectives to the list of terms. This will give you suggestions for your domain name. Depending on the domain name, alternative spellings may also make sense. If you use hyphens, you should also register the same domain without hyphens. The same applies to domains with umlauts or other special characters. Otherwise, some potential visitors may not visit your website because they are unable to find and insert these characters. With so many possible domain extensions, the choice can be difficult. The .com domain is a classic. Because of its popularity, however, it is often the case that the desired domain is already taken. Luckily, there are other generic domain extensions. If your website has local relevance, you can also choose the .at extension. It is better to avoid using longer domain extensions, unless they exactly match the desired name. Choose a short domain name, as this reduces the risk of your visitors making typos. Short domain names are also easier to remember. If your preferred domain name is long, try finding a shorter variant using abbreviations or synonyms. If you now have one or more desired domains, you can check them above with our domain checker. Ideally, your desired domain will still be available. The domain checker checks all domain extensions. You may discover a combination that you like that you had not considered before. If your preferred domain names are still available, you can register them by clicking on ‘Buy’. However, some domain extensions cannot be registered freely. In these cases, you will be shown what the domain registration requirements are and how they can be met. You can also purchase additional domains conveniently via My Panel.